Home / health / What Happens When A Fly Lands On Your Food?? 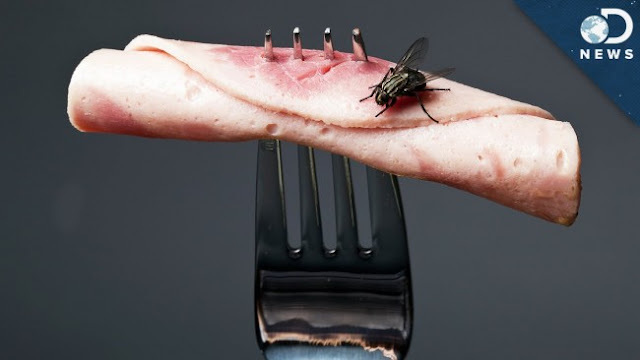 What Happens When A Fly Lands On Your Food?? A recent survey asked participants: “if you were at a restaurant, which critter would make you drop your fork: Rodents, cockroaches, flies, ants, or snakes?” 61% chose cockroaches. But scientists warn that flies are actually two-times more likely to spread germs – specifically those ubiquitous, hard-to-swat houseflies. So what’s the science behind this? Well, flies eat some of the grossest things imaginable: Poop, garbage, rotting animal carcasses. Another fact about flies is that they can’t chew, so in order to eat, they spit-up enzymes onto their food, which dissolves it and lets them slurp it up. Even though it’s probably the grossest thing imaginable, it’s actually the bacteria and viruses that get stuck to their body that spreads disease and makes people sick, not their enzymatic spit-up. They only need to touch your food for a second for their legs or the tiny hairs all over their bodies to transfer germs from all those nasty things they eat onto what you’re eating. And since flies can transfer serious, contagious diseases like cholera, dysentery, and typhoid, it’s probably best if you avoiding eating things that a fly lands on. Are you the type of person who throws out your food if a fly lands on it? Have you become one after watching this video? Let us know in the comments section below because we’d love to hear from you. BREVARD, Fla. — Answer this question while you are not eating: Which of the following would make you stop chowing down if you spied them while you were in a restaurant?